In contrast, Bernie, the 77-year-old socialist, wishes everybody would just shut up about Coates’ divisive issue of reparations and get back to talking about nonracial kitchen-table issues such as Bernie’s Medicare for All. Look, Bernie tries to hint to Democratic voters, blacks will do well on average out of my programs, but that’s not what’s going to get me elected president. And to see a candidate like Senator Sanders just hand wave reparations away like it’s nothing—who says, “I think there are better ways of dealing with this than writing a check.” When writing checks is a basic part of how…there’s nothing wrong with writing people checks! But, TNC admits, the checks aren’t really the point. As Dave Chappelle memorably noted, many blacks would immediately waste their reparations. The important thing in TNC’s mind is to unleash the power and prestige of the state upon endlessly blaming whites for the failures of blacks. If you want Coates’ vision of the ideal future, imagine a pair of black gloves slapping a white face—forever. The war between Bernie and TNC pits the old Marx-influenced left, with its hardheaded obsession with class, power, and money, against the new Coatesian left, which cares more about whether Marvel’s next movie features a black, female, or nonbinary superhero. From Bernie’s perspective, the masses should use their larger numbers to seize democratic power from the rich and take much of their money. Other identity issues, such as racial reparations, however, distract from class unity and offer wedges for the wealthy to divide and conquer. Sanders sees as one lesson of the enduring triumphs of the New Deal, such as Social Security, that what works politically is non-means-tested entitlements that entitle everybody. Likewise, Medicare is a popular remnant of LBJ’s Great Society because if you live long enough, you are eligible for Medicare. You don’t have to be one race or another, rich or poor. You just have to get old. In 2016, most black Democrats voted for Hillary over Bernie. But it’s possible that the black church-lady bloc that turned out in such massive numbers to reelect Obama in 2012 will warm to Sanders this time around. Blacks tend to be low-information brand-name consumers. At the moment, they seem to be leaning toward Joe Biden, because he was Obama’s vice president. But Bernie’s tax-the-rich platform isn’t a bad deal for blacks even if it betrays TNC’s demand that white supremacy be exterminated. And Bernie’s been promoting the same ideas for roughly ever. There’s never been a New Sanders. So eventually black voters may come around to him. On the other hand, among the small numbers of blacks who care about opinion journalism, of whom TNC is the most financially successful, and among the much larger numbers of woke whites who force themselves to overlook Coates’ embarrassing mental dimness, Sanders is just not antiwhite enough. Bernie’s FDR-on-steroids act is grating on the woke, who learned from TNC that New Deal redlining is the root of racial inequality. You see, the reason blacks don’t have enough homeownership wealth is because of redlining in government loan programs from 1938 to 1968. TNC, whose summary of his school days is “All is fog,” is hazy on what happened over the past 51 years, however. Gentrifiers love to advocate the idea that the reason blacks still must live in convenient locations near the Chicago Loop is because FDR redlined them out of Dubuque. I think we as political writers—and this is one of the reasons why I’ve been making comic books and other things… Because our politics occurs within the imagination of the citizen. If I don’t believe that black people are human, it really doesn’t matter what you say to me about policy. So the question is:… How do we decide who our heroes are, and who our heroes aren’t? In other words, Coates cares deeply about that little boy’s question: Who would win in a fight? Your hero or my hero? Our mass entertainment culture has, over the course of a century, spent most of its time reinforcing the idea of black people as undeserving, as lazy, as any number of stereotypes…. Willie Horton, the welfare queen… Because it’s the imagination that sets the terms for what’s possible in terms of policy. And so popular culture matters. Coates’ notion that mass entertainment culture has been devoted to stereotyping black people as undeserving is, of course, absurd. But it helps explain some of his popularity in an era in which it is considered sophisticated to argue that Will Smith shouldn’t be cast as Serena and Venus Williams’ tennis dad because he’s not as dark-skinned as Idris Elba (while others argue that Smith, unlike Elba, deserves the role because he is an ADOS: American Descendant of Slaves). Can you imagine what Socialist Senator Sanders thinks of these energies devoted to which millionaire should get richer? 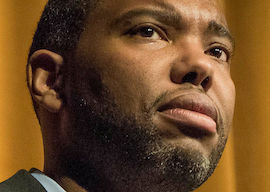 Unlike Bernie, Coates is concerned with the old-fashioned comic-book virtues that appeal to 9-year-old boys: honor, status, representation, heredity, antiquity, and vengeance. Inigo is enormously popular with audiences because he heroically exemplifies unsophisticated premodern values. Likewise, Coates’ Inigo Montoya Progressivism isn’t based on any highbrow theory of class or liberty or even of minoritarianism. Instead, Coatesism is the reactionary idea that the Bad Guys are the people who impugned the honor of the Good Guys, and we know who the Good Guys are and who the Bad Guys are, and they will be Good or Bad forever. Granted, today’s minorities will soon be the majority, but whites will remain the vile legacy majority. In Coatesism, white people’s Bad Guyness is hereditary. I am deeply scared of any attempt to close the wealth gap, to ameliorate the broad socioeconomic disparity in almost every field between blacks and whites in this country, that avoids talking about why those disparities are there to begin with. In 1968, that was a plausible argument, but 51 years later, the contention that “the broad socioeconomic disparity in almost every field” is explained by white evilness can only seem persuasive by punishing experts familiar with more logical causes, such as the racial gap in average IQ. For example, it was announced this week that after years of the left-wing New York de Blasio administration trying to boost the number of blacks who score high enough on the entrance exam at Stuyvesant High School, only seven of the 895 qualifying students this year are black. TNC argues in favor of his science denialism on the grounds that noticing that some people are not as intelligent as other people dehumanizes them. Yet Coates doesn’t mind being relentlessly praised for his own intelligence. And no doubt his IQ is higher than that of, say, 95 percent of other blacks. His would be a more persuasive contention if Coates himself had turned down his $625,000 MacArthur genius grant on the grounds that it dehumanizes all of his fellow blacks who aren’t labeled geniuses. But Coates cashed his check. A better claim is that even as IQ influences income, it shouldn’t determine moral worth. And a superior history-based argument is that whites, blacks, and American Indians are the three historic races of the United States, and we ought to favor one another over the rest of the world. For example, one big reason so few blacks qualify for Stuyvesant HS is because the school is 74 percent Asian, many of whom aren’t American citizens. Restricting Stuyvesant admissions to American citizens would be a way to help African-Americans as Americans.